Polmark Beach Cottages are centrally located in the Padstow peninsular. The town itself is 2.5 miles away, famed for Rick Stein and fast becoming the gastronomic capital of Cornwall. Restaurants, takeaways and pubs are in abundance both in the town and the surrounding villages, which are also home to many well known beaches. There are 6 beaches within 3.5 miles of the Polmark. Padstow is a treasure. Nestled on the banks of the Camel Estuary, its fishing harbour is one of the only sheltered spots on the otherwise rugged North Coast. While best known for seafood chef Rick Stein this stretch of the North Coast has become Cornwalls gastronomic capital, also attracting Paul Ainsworth’s No 6, and Jamie Oliver’s Fifteen at Watergate Bay, alongside our own favourites. 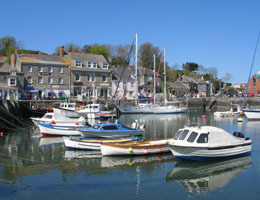 Padstow also hosts our local Tesco supermarket, fishmongers and farm shop. Harlyn is one of the best family beaches in Cornwall but if you fancy a change you’re spoilt for choice with 6 other beaches to visit. 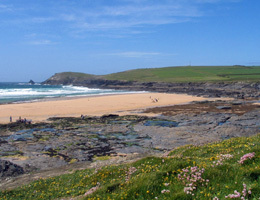 Trevone and Mother Ivey’s are both within a mile of Harlyn, these smaller beaches offer a change as do Constantine Bay and Boobys Bay which are good alternative surfing spots. Both lifeguarded in the summer, Boobys even has its own shipwreck in the sand.